I love being in education. Especially this time of year. The kids and I are spending time at the pool some days but some days we barely get out of our pajamas. We are lounging around and steering clear of the 100+ degree weather outside. The upside of being home is getting to spend so much time with my kids. Let’s be honest though, sometimes the down side of being home is spending so much time with my kids. We are getting a little stir crazy and kind of sick of each other. So tonight I stepped out for approximately 20 minutes to run an errand. Here is what happened in the 20 minutes while the kids were in my husband’s care: Parker made a mess in the bathroom with the new hand soap that I put in there earlier and then peed his pants. When I heard this, I have to tell you, I laughed. It’s just a typical 20 minutes in our house. I saw a little boy with a shirt on that said, “My parents are exhausted”. I almost asked him where he got it but I don’t think he was old enough to talk. So I have around 3 weeks left of my vacation before the real world slaps me in my face. I’m going to keep living it up. To my teacher friends: I hope you are having as much fun as I am. To my non-teacher friends: Maybe you should consider a job change. There are certain types of things that you see on Facebook that just make me giggle all the time. The picture in the bathroom mirror pose…what is this about? I try not to take pictures of myself so I’m not sure fascination here. The pregnant girl who refuses to show a belly shot…THIS MEANS YOU KIM BALDWIN!! Status updates that have a lot missing…Example: “Finally home from the hospital” Uh, wait? Why were you in the hospital? Getting unfriended by someone you think might be crazy. How dare THEY unfriend you. I enjoy Facebook. I really enjoy seeing all of the pictures of my friends and family. It makes it a lot easier to keep up with whatever one else is doing. With this said, if one of your Facebook pet peeves is people posting annoying stuff about their kid, you might want to block or unfriend me. I’m just documenting all the crazy stuff that Parker does so that when he is famous for being a crazy comedian, I will have proof of why he needs to build me a new house. I put pictures of my crazy kids on here for my long-distance family. It’s a lot easier than emailing each picture individually. So if you get tired of it, sorry. What are the things people put on Facebook that makes you giggle? I would like to apologize for everything I put you through during my childhood. All of the smart remarks, mouthy comebacks and disrespect (I’m sure some of you are shocked that I did any of that). It’s true. I spent most of my life from age 7 or 8 until 14 in my room grounded for something I probably said. The reason for my apology? Yesterday, I got a preview of what Paige’s preteen years are going to be like and it isn’t pretty. Let’s just say at one point I asked her if she thought she was smarter than me. It was not a good day and I’m dreading the years to come. Hopefully she will be smart like my brother. When I was maybe 14 and he was 7, I remember one night that I had mouthed off and got grounded. My brother came in and asked me why I didn’t wait to say the mouthy comments into my pillow once I got to my room. He informed me I would get in a lot less trouble. I never could figure that out. Hopefully, Paige will listen to his advice. Between Parker’s comedic acts and Paige’s drama, this momma definitely keeps busy. How many days til school starts?? 7. Cooked a new recipe for dinner. As I sit here waiting patiently for my last cans of green beans to be finished, I just had to giggle. Ten years ago I could barely cook Hamburger Helper. With the help of Rachel Ray and my friend, Teresa, I have made a complete turn around. I don’t like a lot of the foods Rachel Ray makes but I learned the basics from her. (how to cut up things, how to ad lib a little with recipes). Teresa once told me (back in my single days) that I needed to learn to cook to be more marketable. I would sit at her kitchen counter and be in awe of all the things she would can and make for her family. Well Teresa, I took your example and ran with it. You would be proud of me, you might not even recognize me. It was a lot of work today but when I’m chowing down on sweet corn in February, I will be glad I put in the effort. I love organization. The Container store is so fun! There’s one problem. I, by nature, am a mini-tornado. Another problem is that my wonderful husband is a neat freak! This makes for some problems in our household. I have to say that we have both come a long way. I have gotten better at picking up after myself and Blake has chilled out a little. Back to organizing, if an organization project can team up with making life easier for my kids, that is the ultimate. So today I took the time to work on a little project that I have been meaning to do for awhile. It’s not a mind-blowing concept but I’m so excited for how it will help make my kids a little more independent. I have had a snack basket in my pantry for awhile. This is supposed to be a central place where my kids can go get snacks. It’s a great idea but it became a dumping ground and was a mess. So here’s how I made it work for me…snack sized ziplock bags. 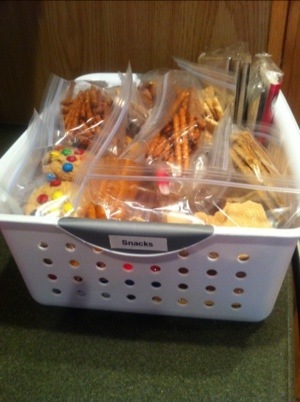 I made kid-sized snacks into these baggies and put them all in the basket. Now the kids can grab a snack and not make a mess or take a whole box of crackers to eat until they ruin their dinner. I put a gift bag beside the basket. My hopes are that empty baggies can go back in this gift bag and I can reuse them. Then I took it a step further. What about snacks that are in the fridge? Easy. 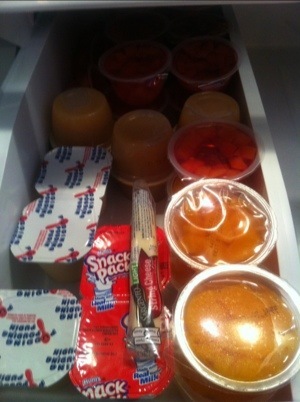 I designated a spot in the fridge for these snacks too. I’m sure I’m the only one that finds a box of graham crackers in the back of the pantry that are old, old, old. That drives me crazy! I’m hoping this will help me not waste snack food and give the kids more options. I think it’s going to be important to have variety. We’ll see how it works. What organizational tips do you have to help make your life with kids easier? ?